It’s often said that consistency is a virtue and if that’s the case the 4-year-old ICF trotter Picky Picky Valor has earned the title has the most virtuous trotter at the Hawthorne summer meeting. The pride of the Gerald Hansen Stable has put together a unwavering money-earning season for his owner Shelley Steele of Monee, Illinois. Picky Picky Valor is making his 21st season start, often in Open company or against the top older ICF trotters, and hasn’t missed a purse check. In fact, “Picky” been third or better in 18 of those 20 outings and has finished first or second in nine consecutive races going back to mid-June while making over $56,000 in his third season of racing. 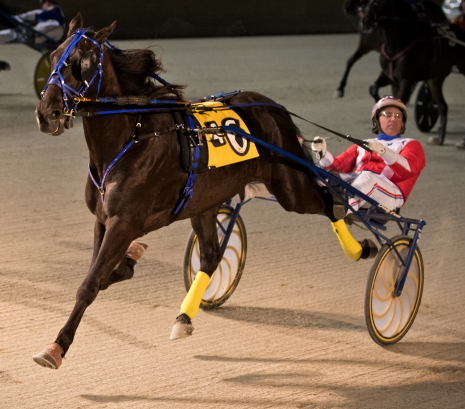 Picky Picky Valor has another tough assignment Sunday night to keep his one-two streak intact. He’ll face five other talented trotters when he leaves from the outside six-slot with driver Casey Leonard in the $10,000 Open feature drawn by groups. Back at Hawthorne after another successful meet at Running Aces is the nine-year-old veteran Banker Volo (Travis Seekman) with over $400,000 in career earnings. The son of Yankee Glide also boasts 36 lifetime victories with 15 coming in 2017 and five more this season, four in Minnesota and the other in a Hawthorne Open back in mid-January for current trainer Angie Coleman and Grinnell, Iowa owner Jeralene Roland. Banker Volo made four starts at Hawthorne last summer, all in Opens, winning one and second best in a pair of others. The fourth inside posts in Sunday’s Open trot belong to All About Cowboys (Juan Franco), Pine Dream (Brandon Bates). Dr Spengler (Mike Oosting) and Bo I See Time (Kyle Wilfong). The 4-year-old Pine Dream will be making his debut for the Chupp Racing Stable of Crete, Illinois. The newest addition to the Kelly Chupp barn had a very successful campaign this year in Ohio competing at Miami Valley Raceway, Scioto Downs and on a number of Ohio Fair Circuit tracks. 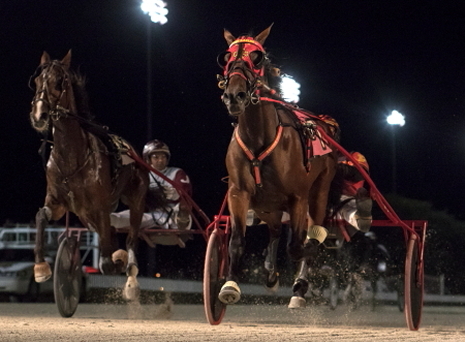 Among Pinetucky gelding’s seven triumphs in 2018 was a career fastest 1:53.1 mile back in April at Miami Valley Raceway in Dayton. Chalk It Up: “Chalk” players were all smiles after last night’s Night of Champion stake series for 2-year-old colts and geldings were in the history book. The Buckle (Casey Leonard) and Meyer On Fire (Mike Oosting) both proved best at overwhelming 1 to 9 odds in their respective Incredible Finale divisions for freshman pacers, each paying a paltry $2.20. The Kadabra series divisions also saw the favorites prevail and both in front-stepping fashion. Trixie’s Turbo ($5.60) won nicely for driver J D Finn in 2:01.3 and two races later Oosting was back in the winner’s circle, this time with the 1 to 2 public’s choice Louscardamon ($3.00) after he drew off by almost five lengths for his winning trainer Steve Searle with a 2:01.4 mile. Your Welcome: Saturday was a very good night for “Mike’s Price Shots.” Both selections, Ideal Oath and Et Tu Brute popped. Ideal’s Oath (Juan Franco) paid $12.40 in race nine and Et Tu Brute (Robert Smolin) returned $14.40 in race twelve.